So you're looking for homemade gifts in a jar ideas? I'll never forget the first cookie mix in a jar gift I received... 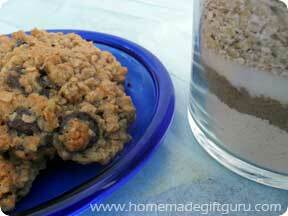 The mix was layered to perfection, the cookies were easy to make and they came out tasty. These are the qualities of a great cookie mix in a jar and the qualities I strive for in all my recipes and techniques. If you're looking for quality recipes in a jar, here you go! From cookies to homemade Kahlua, "recipes in a jar" is where I post my homemade gifts in a jar recipes and some from around the web. 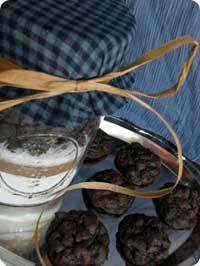 Homemade gifts in a jar gained their popularity with layered cookie mixes, which continue to be extremely popular. Interestingly, there's more to give in a jar than cookie mixes. 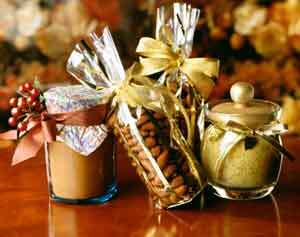 Some of my favorites are canned preserves, store-bought or homemade candies in a jar and bath and body jar gifts. You can read more about the various gift jar ideas here. Some homemade gifts in a jar ideas have nothing to do with food at all... you can hop on over to the HMGG reader gallery and check out this beach-themed wedding gift jar to see what I mean. If you'll be making jar gifts containing homemade mixes, you may want to see gifts in a jar tips and tricks. 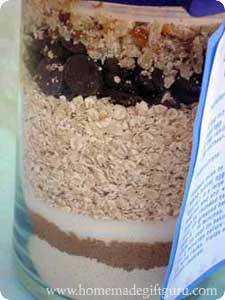 These jar gift tips will help you make a perfect layered cookie mix in a jar the very first time. Don't forget that homemade gifts in a jar don't have to be food related or simply decorative. 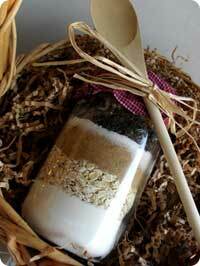 For example, homemade bath salts and other bath and body gifts in a jar make both fun and pampering gifts. You may also like this page about finding and reusing AWESOME JARS for homemade jar gifts, which helps to keep the cost down. I have a few tricks to share like re-using and re-cycling jars and bottles you might otherwise discard. Plus, learn how to get rid of stubborn labels and odors when a simple soak and scrub is not enough. Most mix recipes in a jar are made to fit in a 1 quart mason jar (or other 1 quart/1 liter jars). Alternatively, you can use a cellophane bag (often called a treat bag and available at craft and party stores) sealed tight. This is a good idea if you'll be mailing the gift. Some jar gift ideas are more flexible than others, such as drink mixes or candy assortments, and can be used with a variety of recycled jars already hiding in your own kitchen (as I get into in the article above on finding great glass). What a great excuse to get creative and green! 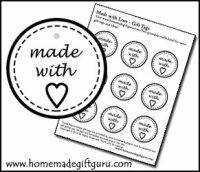 Pssssss... don't miss my free printable gift tags made SPECIAL for your homemade gifts! Holiday Gifts - We all give a lot of gifts around the Holidays. There's so much going on from Thanksgiving, to Hanukah, Christmas to New Years. It can be overwhelming at times. Homemade gifts in a jar will let your friends, family, co-workers (anyone special to you) know you care without becoming a burden on your budget. Jar gifts make thoughtful homemade gifts during times where small gifts are most appropriate or your budget simply requires thoughtful but inexpensive homemade gifts. If you like homemade gifts in a jar ideas but want to make a larger impact, try making a homemade gift basket, containing one or more homemade gifts in a jar and some other homemade goodies. People ask me all the time where I get my jars and bottles for jar gifts. To be honest, I don't have one single place I can always count on (at least not and get a bargain!). The big secret is to keep your eyes open whenever you're at discount, thrift, dollar or grocery stores. When you find a great deal, buy a few. If you're in a pinch, you can always find great jars at craft stores and super stores like Walmart and Fred Meyer's but they tend to cost a few dollars a piece, which isn't always practical for making jar gifts. In this instance, as is often true when it comes to craft supplies, waiting until the last minute to look for jars may cost more. My advice is to try stocking up on some of the following when they are on sale throughout the year and be assured, if I find a magic store for bargain priced jars I'll post it right away. Wide Mouth Canning Jars - end of summer sales, these are the most widely used jars for jar gifts so stock up! I also find them from time to time at yard sales and thrift stores but be sure they are in great condition with no chips, cracks or defects and buy new lids for them. If you only need one, try the craft store - they often sell a single jar for a little over a dollar. Other Sealing Jars - yard sales, thrift stores, bargain stores, dollar stores, craft stores and of course keep an eye out for interesting containers you could re-use from the grocery store like sauce, syrup, spirit and jelly jars. Fabric - fabric, mesh, cheese cloth, burlap... get them during craft store sales which happen throughout the year, seasonal patterns often go on sale a couple weeks before and right after a holiday. Beads, Buttons and Charms - these add class and charm to jar gifts, keep an eye out for holiday sales and discount store deals in the crafting isles. Flowers - for decorating jar gifts, dried flowers or silk flowers, felt flowers are popular these days as well. There are many ways to decorate homemade gifts in a jar. The simplest most common way is to tie a bow around the gift and attach a recipe tag (feel free to use these ready-to-go printable gift tags as well as free printable gift tag templates any time you need them). Also popular, is to include a 7 inch piece of round or square fabric over the lid and secured by a piece of raffia or ribbon. If you do this, you'll want to secure the fabric with a rubber band first and then cover it with the ribbon - it's much easier this way. You can also use the canning ring to secure the fabric. You can attach flowers, use stickers or decals, decoupage the jar, apply more ribbon, buttons, beads, charms and/or keepsakes. For a more formal gift presentation, you can make or use a fancy cloth bag or wrap the jar in a piece of lightweight or sheer fabric. Probably the most functional out of these keepsake ideas is the wooden spoon. You can get wooden spoons for about 30 cents a piece at dollar, discount and some craft stores, plus they're easy to attach. Just slip them under the rubber band and then tie your ribbon over both.